God's Word is under attack from many sides today. Some question whether it can be taken as actual truth, or whether it must be interpreted in light of whatever modern culture deems scientifically "true" at any given time. ICR's stance is that the Bible is not only authoritative and accurate, but that the scientific evidence is consistent with a recent creation completed in six days, and with a global deluge that reshaped the earth in the not-so-distant past. Much of ICR's early work focused on geological research of the Flood described in Genesis 6-9. Our research uncovered abundant evidence that "the world that then was, being overflowed with water, perished" (2 Peter 3:6), just as Scripture described. In a strange way, the catastrophe of Noah's day may seem vaguely similar to the remarkable upheaval the financial markets are experiencing today. In fact, the entire financial spectrum has been impacted, with news of bank failures and consolidations, plummeting home values, and significant decreases in personal retirement funds as the stock market sinks to new lows. Truly, the global financial landscape appears to have been drastically, and perhaps even permanently, transformed. As can be clearly seen, rates of return on charitable gift annuities are much more attractive than other forms of guaranteed income, and ICR is pleased to be able to offer these to our supporters. Unlike common CDs, charitable gift annuities provide several wonderful benefits in return for your gift that CDs simply cannot match. First, annual income is guaranteed for the lifetime of the donor. Second, because ICR is a non-profit ministry, we can provide a partial tax deduction for your gift in the year it is made. 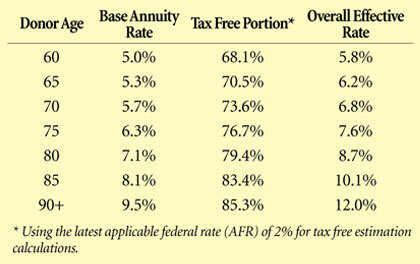 And third, a sizeable portion of future annuity payments is tax free. What a wonderful opportunity to sow and reap bountifully, not only for your personal needs, but also for eternal Kingdom work! If you desire to support the work of ICR in some way but still need ongoing income, please prayerfully consider a gift annuity. Since charitable gift annuity rates increase by age, ICR would be happy to design a customized proposal for your consideration. Simply contact ICR at 800.337.0375 or stewardship@icr.org and provide your name, state of residence (certain states are excluded), birth date, and the gift amount you are considering (5,000 USD minimum), and we will be delighted to do the rest. * Mr. Morris is Director of Donor Relations. Cite this article: Morris IV, H. 2009. Charitable Gift Annuities. Acts & Facts. 38 (3): 19.